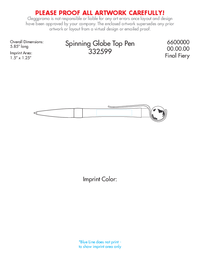 • The Spinning Globe Pen provides a fun and unique take on the idea of "global" branding! • Simply give the globe a-top the pen a flick of the finger to see the world spin right there in the palm of your hand! string(31) "Blue / Silver Trim SKU : 332599"
string(33) "5 working days after art approval"